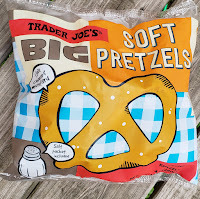 Show me a person who says s/he doesn't like soft pretzels, and I'll show you a liar. It's impossible to not enjoy a quality soft pretzel. I mean...salty carbs, what else do you need, right? Some folks say that Philadelphia is the capital of soft pretzels, but even though I'm from that area, I disagree to an extent. 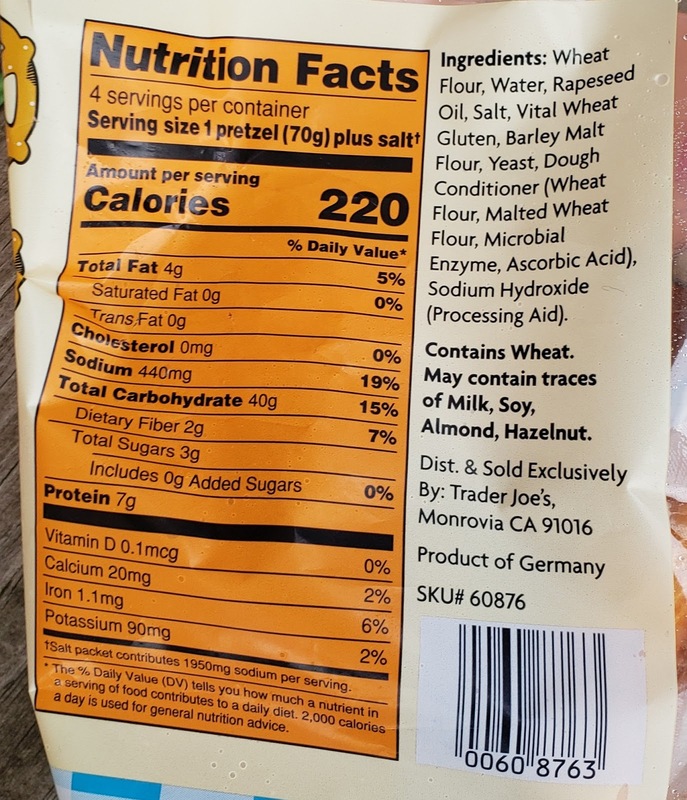 Philly-style soft pretzels are often cold, a bit stale-ish, a bit more "hard" than "soft", and if bought from a street vendor who hasn't had a health department inspection in a while, who know what "extras." 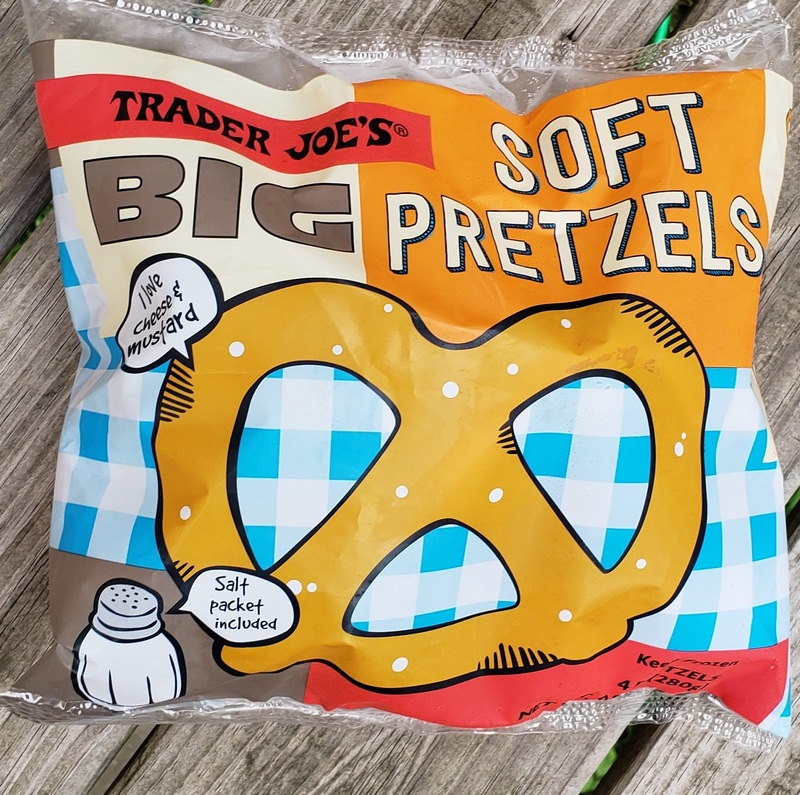 I mean, given the opportunity, I'll down close to my weight in them - soft pretzel party platters from these guys are the devil - but an actual warm, soft, slightly chewy pretzel with a slightly crispy outer shell? Give me that all day long. ...except, man, as any good pretzel, they're freakin' delish. To prep, you may choose to either heat for a couple minutes in the oven, or let thaw for about an hour or so. 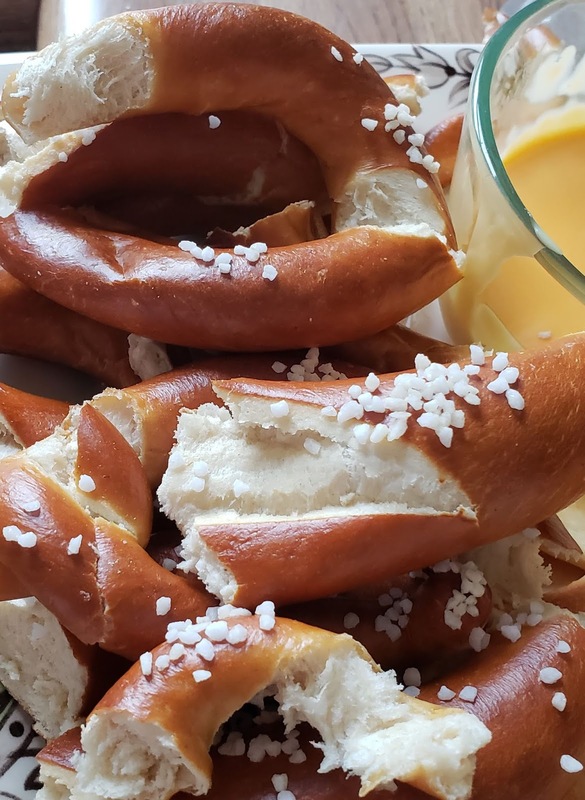 Most other frozen soft pretzels say to microwave them, which is a cardinal sin. That makes the pretzels hard and tough and generally not as enjoyable. Sandy made these TJ's softies as part of a light "snacky" dinner the other night using both methods. The pretzels heated in the oven were softier and almost flufflier on the inside than the one we let thaw out, which makes sense. It's a pretty plain dough, with slight eggy flavor from the shell, and both types had that requisite chewiness. Couldn't seem to really get the salt to stick to the thawed out one, though, as much as we tried. Oh. Salt. There's plenty of it, in the typical big grain crunchy crystal variety. I'm not even sure we used 10% of it. The rest is going into the winter sidewalk deicing stash for sure. Not much else to really say, it's a good pretzel. Eat as is, melt some cheese on top, dip into whatever you'd like...it'll all work. Can't exactly go wrong. Double fours. $2.49 for 4? I spent $3 for ONE in Central Park which I had to throw away. It was filled with "cheese" which sounded good if it was warm, but it was cold. And cold fake cheese is disgusting. I have come to the conclusion that park food is only for times of absolute desperation. Still, soft pretzels seem like something one buys on the go rather than eating at home. Unless one is a super fan of these things. Yours certainly sounds more appealing than mine! Dollar Tree sells pretzels too in the freezer section. I miss the apple cinnamon pretzels that were sold in Central Park it was so good! 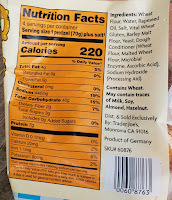 what I liked that it came from Germany so it is the authentic pretzel! I wonder if it is any difference from Superpretzel? I haven’t seen these yet!! Very excited! Although turning on my oven is just not happening.... maybe i can defrost and then put in a pan with a lid for a little bit? The best part- aside from the salt- is the mustard of course, i’m VERY into the dijon aioli lately, but i have a mustard collection of sorts so i’ll probably go with the classic brown mustard. Hope my store has these this weekend! You can heated in a toaster oven on toast setting for about 3 min or so. They're really good. Dollar Tree also sells the best vegan preservative-free all natural spring rolls I’ve ever eaten. I’ve had restaurant spring rolls that match the quality, but none that beat it. I love soft pretzels. Frozen Superpretzel are sold in the larger Safeways for like $2.50 for 6 but these seem bigger. Generic ones are usually $2 and I'm sure the exact same item, but convenient to have TJ sell so might try. I really liked these, but the issue is the packaging. Why is the bag filled with air? It takes up so much space in my too small, too packed freezer. I open them and stick them into Ziploc bags instead. Good idea, I'm doing the same. The bag ripped immediately also. I buy these from Schwans, and they come with both salt and cinnamon and sugar for toppings. I love them! These pretzels are absolutely delicious.I heated in a toaster oven set on toast. The flavor and texture are perfect. They're so good that I prefer them with just a little of the salt that comes with them. I'll definitely buy them again and keep a few bags in the freezer.